Rachel Schneider, aka RaShell, has always been fascinated by the variation in texture, shape, color and incredibly fine detail provided by nature. In her unique and original seashell mosaics she uses shells from the beaches of Jamaica. Her work is inspired by Mother Nature, contemporary art and Ancient Roman mosaic, as well as by the music, culture and people of Jamaica. 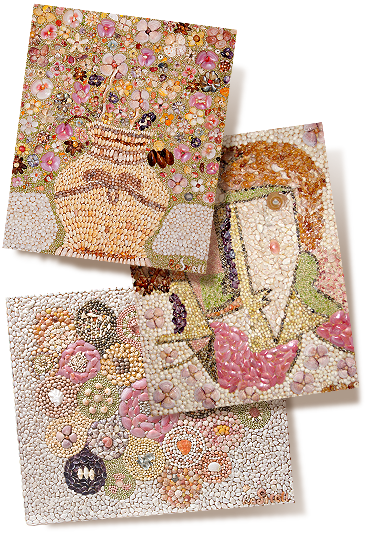 Her mosaics can be found in private homes in New York City, The Hamptons,Atlanta, GA, Houston, TX, Virginia, Rome, Paris, Bangkok, Naples, Florida, Boston, Cape Cod, MA, Kingston and Montego Bay, Jamaica. They have been exhibited in galleries in Montego Bay, Newport, R.I, The Hamptons, Naples, Florida and on Cape Cod.